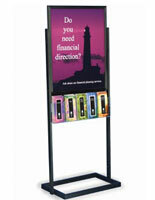 Purchasing veterinary office displays can be a difficult task to integrate into your animal practice. 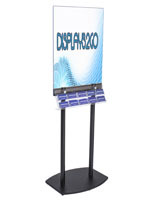 Displays2go can make it simple to obtain the best vet clinic merchandise racks for chew toys or custom veterinary signs for your company. 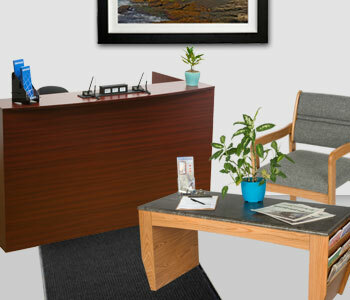 Browse our vet clinic lobby furniture which includes waiting room chairs, reception desks and custom nylon rugs for the doorway. 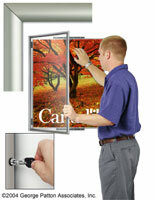 More Hook Length Options Available! 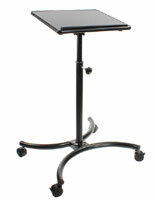 We want to see your customer’s jaw drop when walking into your animal clinic. 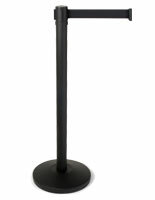 For a larger animal hospital it may be wise to purchase metal or plastic stanchions with signs to easily direct clients toward the check-in counter. 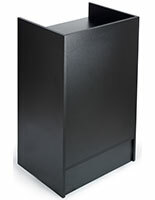 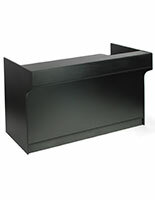 Reception desks and cash wraps are also available with lockable cash drawers for your pet business. 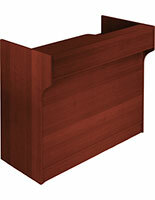 Store animal chew toys or treats with the cabinets' bottom storage shelving and use the top shelf for a computer monitor. 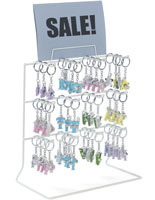 We know that you provide a top-notch veterinary service, but to make your business more personal and maybe even generate more income, why not include merchandise like pet toys, animal flea collars and dog treats? 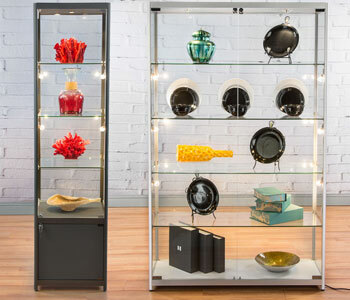 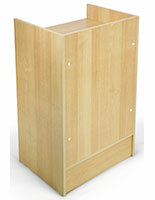 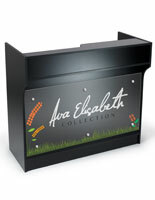 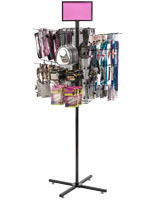 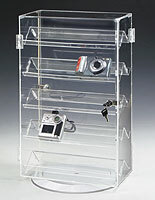 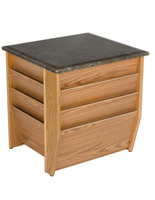 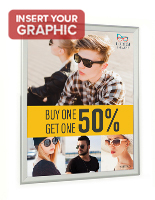 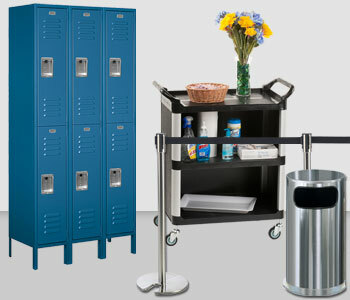 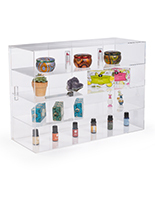 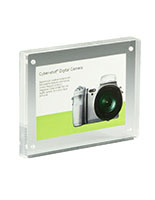 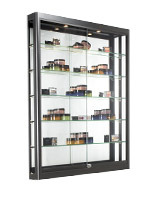 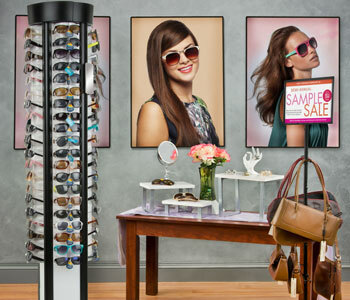 Easily display these products using our spinner racks and other merchandise displays. 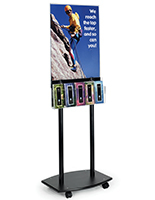 Available in many orientations and mounting methods, these veterinary office displays are great for use in high traffic areas. 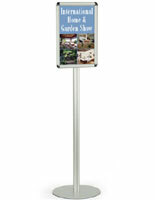 Plus, animals will not easily knock these displays over. 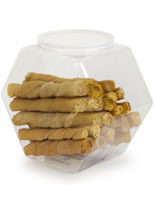 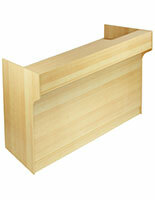 Slatwall displays for the wall are great for keeping your canine away from the juicy rawhide bones and chew toys. 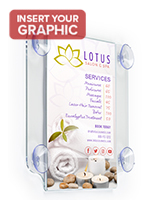 Wall mounted gridwall panels are also great for keeping your merchandise safe from hungry canines but reachable for the pet owners. 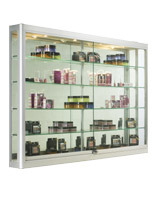 To display heavy products like sealed dog food or medicines, floor standing gondolas (as seen in pet stores) will bring your veterinary office to the next level. 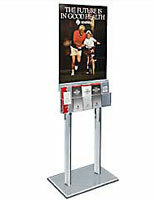 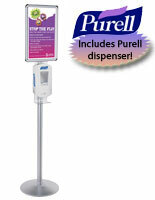 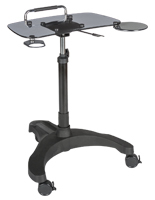 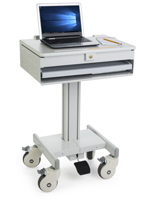 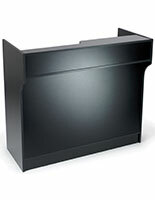 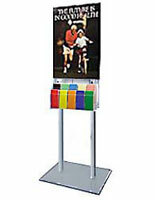 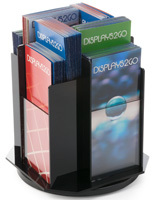 Other displays like brochure holders and magazine racks are essential for your vet clinic business. 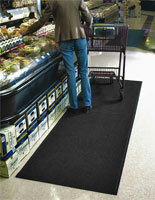 Your job is to inform the customers on how to keep their pets as safe and healthy as possible. 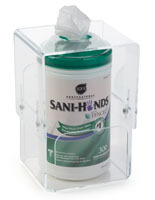 What better way to educate customers than to fill literature holders with articles, booklets and brochures on animal health? 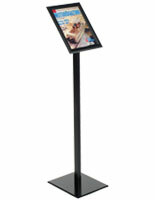 Some ideas for pamphlets can include the newest animal vaccines for diseases, canine medicines, and other pet informational articles. 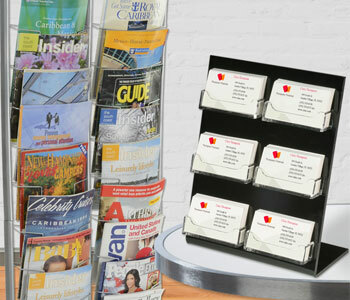 Also, don’t forget to stock your emergency vet clinic magazine racks with the most up-to-date issues of Dog World, Cat Fancy, and The Bark. 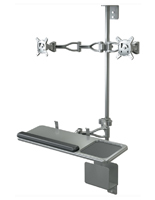 We also stock television mounts and brackets for your animal hospital or veterinarian office to keep your customers occupied while waiting. 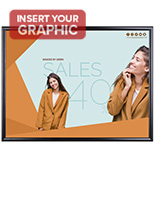 Digital displays and players have the capability for broadcasting the animal planet channel or your favorite funny cat videos while having a sidebar with the local weather. 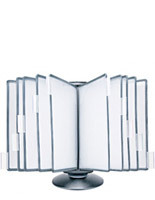 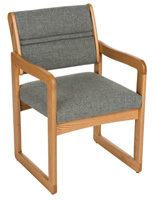 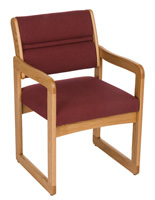 To keep your customers comfortable, we carry a selection of lobby chairs and end tables. 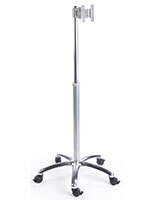 This veterinarian lobby furniture comes in different colors to match your business's color palette. 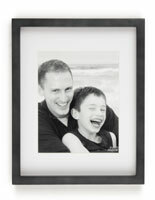 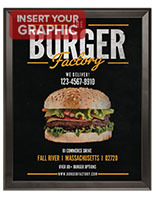 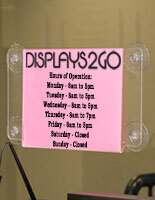 Lastly, you want to make sure your business brand is visible to new customers and local traffic. 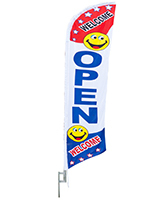 We can help you build your business with vet office signs such as street banners, teardrop graphics, message flags and large custom stretching banners with frames. 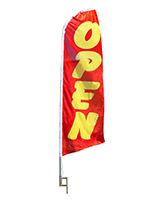 We also offer preprinted “Open”, “Sale”, and “Grand Opening” flags for veterinary clinics. 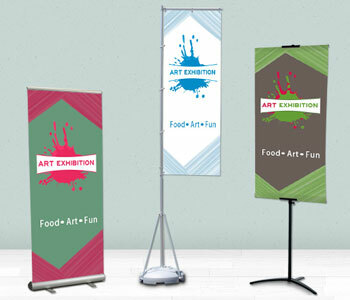 Our amazing customer service professionals will walk you through the printing process and smoothly help you get the custom banners you always wanted for you vet business. 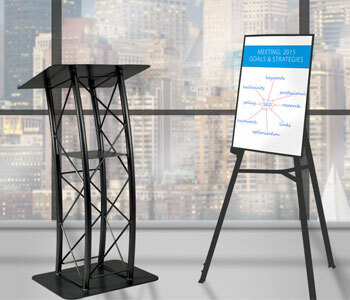 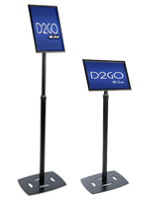 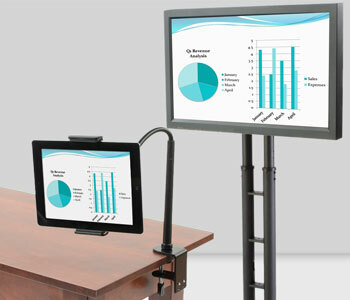 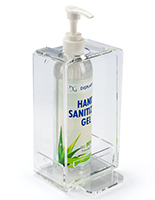 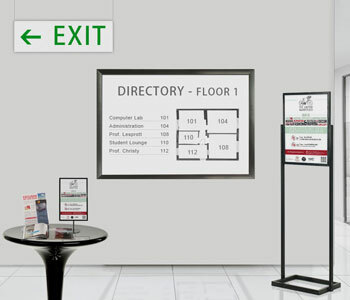 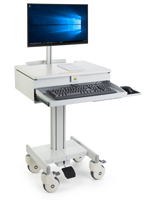 Remember, whenever you’re in need of veterinary business displays you can find everything you need at Displays2go.